Shirts With Random Triangles: Author of new book about 2011 Tuscaloosa tornado discusses relief effort's affect on Nick Saban. 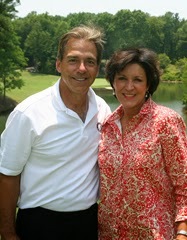 In an interview with al.com, Anderson, a journalism professor at the University of Alabama, explained how the Saban's efforts to help the community recover from the storm "knitted him and (his wife) Terry into the community." "If not for the storm, he may have left already," Anderson says . But he's going to retire there (Tuscaloosa). . . .
"For the first time in his career, it made him feel like he's a member of a community," Anderson added. "He's been sort of a mercenary coach throughout his career, jumping around from job to job, always in search of something better. And he finally realized everything he wants is right here." Anderson's book is an expansion of an article he wrote about the recovery efforts in Tuscaloosa for Sports Illustrated in 2011.